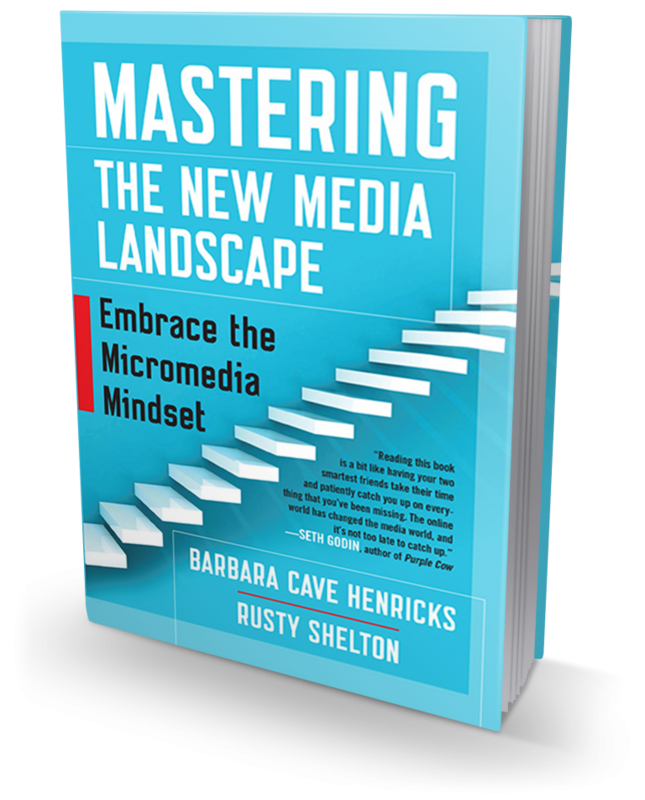 I am so excited to announce that our new book, Mastering the New Media Landscape: Embrace the Micromedia Mindset (Berrett-Koehler Publishers), releases today. We have each been so overwhelmed by the initial reaction from colleagues, media and others and want to thank you for all of your support. 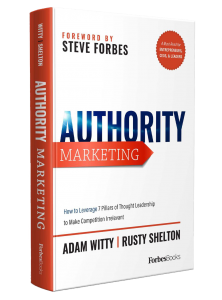 We also want to thank Charlotte Ashlock, Neal Maillet, Kristen Frantz, Katie Sheehan, Jeevan Sivasubramaniam and the entire team at Berrett-Koehler Publishers for their partnership and great work on the book. As two professionals who have spent most of our careers in publishing watching how hard it is to write, publish and promote a book, what would possibly inspire us to write our own? It’s pretty simple – we wanted to empower authors, marketers, thought leaders and activists – those with an important message to share with the world – to do just that. The big question on the minds of those with an important message to share is how to do it in an increasingly noisy media environment. Many who answer this question begin with a focus on social media vs. traditional media and how to develop unique strategies for each but that’s a very outdated way of looking at things. Instead of thinking traditional vs. online, instead we must think media vs. marketing and, in doing so, begin to think more like a media outlet than a marketer. In today’s fractured media environment every individual and/or company is a media outlet – whether they know it or not. Some influence just a few hundred via a Facebook profile or Instagram account while others who embraced a Micromedia Mindset years ago have built audiences via their podcast, blog or email list that rival the size of some of the world’s most well-known media brands. Have you ever thought of yourself as just as much of a media outlet as CNN, the New York Times or NPR? Probably not…but guess what? You are. Sure, you don’t have the have the resources, large-scale distribution, legacy or brand power they do…or at least, not yet…but you do have the ability to build a global audience that subscribes to your content in a very similar way. Our new book shows you how to make the one shift that will change everything by altering the way you think about the content you create. We draw on case studies from some of the world’s biggest micromedia outlets and also look at the three types of media that exist in today’s environment – owned, rented and earned media – and why you must have a focused strategy for each to be successful and avoid spending time on things that don’t work. 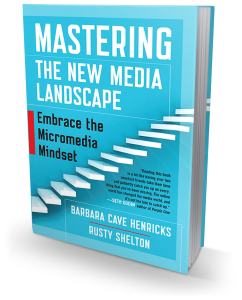 We hope you enjoy Mastering the New Media Landscape: Embrace the Micromedia Mindset (Amazon, B&N, BookPeople, Indiebound, Target, 800-CEO-READ) and we look forward to seeing the great conversations you will start as you begin thinking more like a media outlet than a marketer. For all of our Austin area friends, we’re doing a big book signing and launch event tomorrow night, March 8, 2016, at BookPeople downtown at 7 PM. Would love to see you there! We’ll have an afterparty at nearby Nightcap on West 6th beginning at 8 PM to say thank you for all of your support. Our good friend Becky Robinson of Weaving Influence is kindly hosting Barbara and I for a free webinar on how you can master the new media landscape on March 21st at 12 PM ET. You can register by clicking here.